These are magical times. In a few days the tenth Old School Magic World Championship will take place in Gothenburg. But it is always you guys who make this format what it is; you the organizer, you the player, you the content creator. 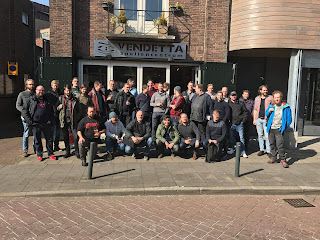 This is a story of a player, organizer and creator gathering the first round table in his town of Hilversum, North Holland. This is Joep Meddens's story. Enjoy! /Mg out. The Dutch old school community has been taking Giant steps lately. The gatherings of the Knights of Thorn have become serious affairs, with the last edition in Deventer boasting 40 players. I had already entertained the idea of organizing a tournament in my hometown of Hilversum. I had even acquired the prize for the first winner: an alpha Hill Giant (for good measure I acquired 5, if it spikes the tournament will be good for the foreseeable future). Playing in Deventer and seeing 40 spellslingers ready to travel to that somewhat remote part of The Netherlands (sorry Mari!) swung it for me. There should be a Hill Giant Cup, with the winner being crowned King of the Hill. 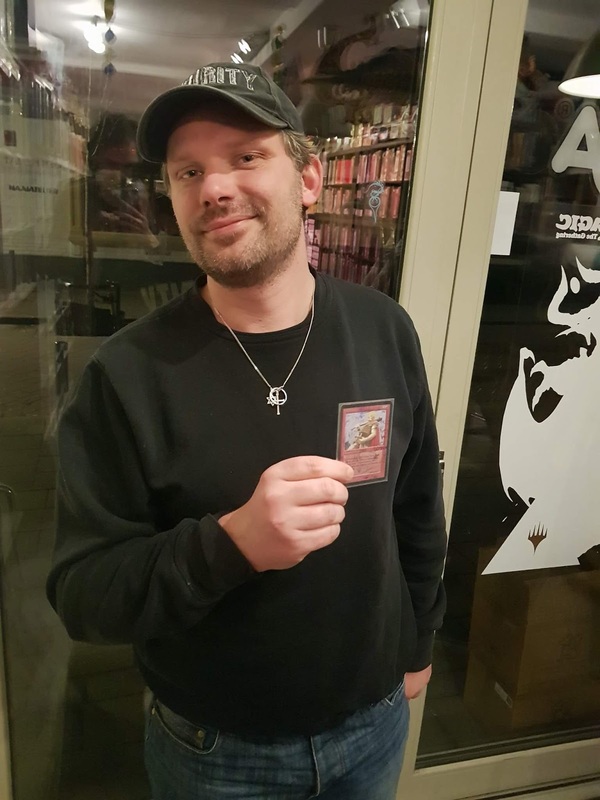 Luckily for me, my local game store owner Robert Kerklaan (Vendetta Spellen) is simply a games enthusiast who enjoys having people over. Clearing the store for a Sunday tournament between a bunch of old guys? Sounds like a plan! When announcing the plan on Christmas Eve, I wished for some positive responses to start of with. After that, I hoped it would be possible to fill 32 spots (and Robert's small store by the way) in the months running up to the tournament. Within a week, the tournament was fully booked. Serious planning could begin. 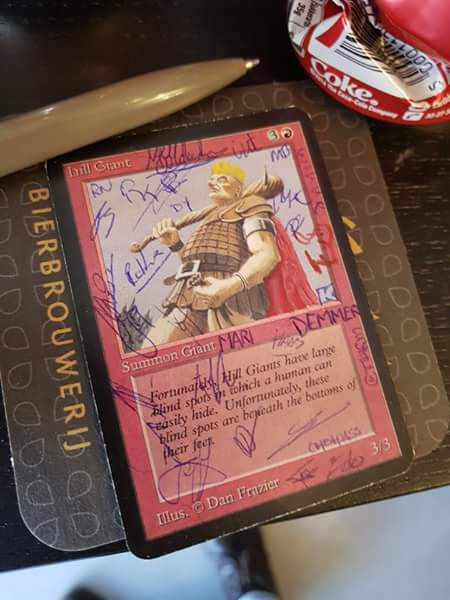 Craft beer from Hilversum was sourced (www.gooischebierbrouwerij.nl, the weizen is my favourite but the chestnut proved most popular on the day), the brewery being so charmed by the idea of their beer entering Magic the Gathering 93/94 subculture that they gave us a deal on the order. Sweet. Robert cleaned up the store and Dutch trader Wijnand provided us with some nice prizes (a playset of Beta Hill Giants being one of the nicer things). 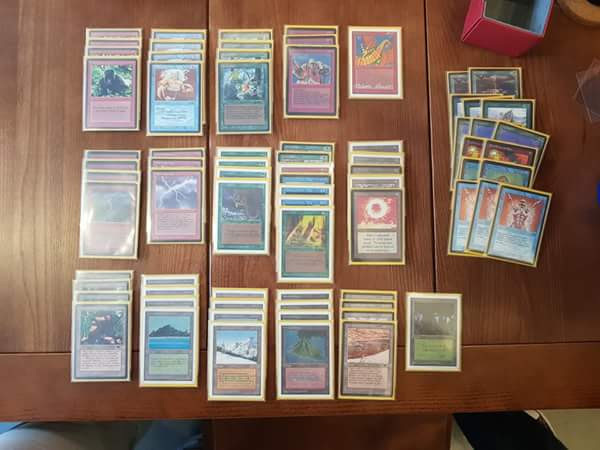 Some Homelands booster packs were added to the prize pool at the last minute; interestingly they ended up with owners of alpha power who were genuinely thrilled to get pack fresh Homelands cards. Finally, our local alter master Jordy made us a true King of the Hill, and we were ready to go! But what to play? My trusted GW Geddonless Erhnamgeddon had brought me to the final in Deventer and to the semi's of Dave's Winter derby on Skype. I love the deck and its annoying Ice Storms. But I really wanted to try something UG this time and so set out to make a new deck without the comfort of 4 Swords and 4 Disenchants. Life without White is hard! A control version of UG sorely lacked the White removal suite. I then tried and failed at a tempo-counter combination (trying to ramp into Serendib/Erhnam and counter afterwards). After a long and hard evening of play testing with Florian von Bredow ("if you like Enchantress, just play her Joep") the Saturday before the tournament, I settled on what can probably best be described as Suicide Ernham'serk'em. Sunday morning, 36 players show up and we find seating for the two extra players. Coffee is served, pairings are made and we are off! David is a recent addition to the old school group, but it does not show in the cards he rediscovered in his cupboard. David brings a very nice black bordered unpowered mono-Black to the table. Game 1, I see a T1 Hypnotic Specter from a ritual. My blue mana shows up just after I am forced to discard my second Psionic Blast. Hmm... I summon a Serendib Efreet but can only make it count if my Orb hits his Icy. I miss the flip and do no recover: 0-1. Game 2 and I get to board in my three Whirling Dervish. I see a Hippie again, but only on T3 this time and my Ifh-Biff makes quick work of it. A Serendib added to the front and Game 2 is mine: 1-1. Game 3 goes according to plan: I cast Unstable Mutation on my T2 Dervish and never look back. 2-1. Not the best possible match-up for any deck, I usually struggle with The Deck. Today it is in the hands of former Knights of Thorn winner (then piloting White Weenie!) Tom Posthuma. Game 1, I surprise myself and Tom by getting of to an unanswered swift start. Serendib Efreet gets some damage in before going Giant Berserk, having been allowed to resolve that I have no problem finishing off with Psionic Blast. 1-0. Game 2, I have a slower start and an early Timetwister allows Tom to stabilize. I miss another Orb Flip. The inevitable happens ten or so turns later. 1-1. Game 3 turned out to be the sweetest of the lot. We see two Timetwisters which seem to help me a bit more than Tom. A third resolves and my hand looks promising. A Mind Twist for seven hits me. I try not to cry as I fill my graveyard. Tom has not found anything to kill me with though. Far too slow for my liking I get him down to 3 with my two Mishra's Factories. Tom manages to stabilize however and things look bleak with me topdecking and Tom on an active Tome. With time running out, I am starting to think about Orb flips (and my misses earlier). Meanwhile, Tom desperately tries to find his Fireball. He resolves Time Walk for a turn and two more cards. Nothing. Next turn the Fireball comes and my 13 life look hopelessly inadequate against Tom's mana reserve. He announces the Fireball. I sigh, resigned to my fate: "OK, tap the mana". Tom obliges and taps out to do 15 damage. I respond with Psionic Blast and, to the amusement of even Tom, steal the game and the match: 2-1. After the lunch break, we head for Match 3. Marten has a collection to envy (mint beta Volcanic anyone?) that he actually loves to use for play. Why own it and not use it? In keeping with this, he advocates the most lenient reprint policy: more opponents equals more use out of his cards. There is definitely a case to be made there, in Hilversum we had a lenient reprint policy and especially for the dual lands it proved useful. Game 1 against Marten sees us both starting of with a Library. However, he strips mine (pun intended) and I have to Regrowth it. This sets me back. Coupled to the 8 life I paid to Sylvan Library to get to 7 cards, I get too far behind. Marten gets to use his Regrowth on a Timewalk, and two Bolts mean I am dead. 0-1. Game 2 and I quickly mulligan to 6. I get what can only be described as the six fingered hand of god. Land-Mox into Timewalk, T2 Timetwister finding my Timewalk again. I can't play it though and I pass for Marten. He scramblers back with a T1 Timewalk of his own that he Regrows on T2. He has to pass though before playing it. I use mine, Chaos Orb his Volcanic in an attempt to block off Blue and put a Serendib on the board. Marten finds City of Brass, casts Timewalk and follows up by casting Su-chi, tapping out and having 18 life left because of the City. I take my turn, and realize my Serendib-Giant Growth-Giant Growth-Berserk is enough for 18... 1-1. Game 3 and I am under the cosh quickly: T2 Su-chi backed up by a Factory is just too fast. I Timewalk, I even Timetwister, but when my Erhnam is Control Magic'ed, my Pixies get Bolted and my remaining five cards are twisted, the game is up: 1-2. Roy is a familiar foe, he beat me with his mono-Black in the Knights of Thorn final. First game, I am simply quicker. A Serendib gets going and when Ifh-Biff gets in on the act this one is mine. 1-0. Game 2 and the nightmare scenario unfolds: City in a Bottle hits the table (at this point I realize Roy did not employ any Juzams for this tournament). As my hand fills up with Serendibs I wait for the Crumble I did not board in: 1-1. Game 3 and I feel I need to get a break on the City in a Bottle front to make it through. I have boarded in the Crumbles, so I do have a shot. I get some early damage in but my creatures encounter Maze of Ith (Roy plays 4 he tells me) and my clock is slow due to an Ivory Tower adding back to Roy's total every turn. He resolves a City in a Bottle again, but this time I am holding a Crumble. I add Serendib after the Bottle goes, but it does mean I am losing life as well. Knowing Roy plays Drain Life, I am hoping to finish this sooner than later. After some nervous turns, I finally find a way to zero with a Giant Growth: 2-1. I am 3-1 and get the feeling one more win will most likely get me in Top 8. Game 1 sees the classic opener Taiga/Kird Ape. Frenk follows up with a Factory and I am getting some serious beats early on. I am in need of answers and Sylvan Library tempts 8 life out of me in an attempt to get past the lands on top. It helps me find an answer (Psionic Blast), but this also puts me within shooting range. A Chain Lightning ends the first one 0-1. Game 2 is over quickly as well: I simply fail to match the fast board development and get Bolted to a 0-2 defeat. I resign myself to my fate, but apparently my losses have come to some really good players (both are in top 8) and I end up number 8 of the lot. This is getting to be somewhat of a theme for me as I ended up nr. 8 in Deventer as well as in David Firth-Baird's Skype summer derby. Michel is a laid-back kind of guy from the Alkmaar region where one of the earliest 93-94 playgroups in the Netherlands started. He plays a very pretty deck made by his friend Dyan. It combined Savannah Lions with Lightning Bolts, Swords to Plowshares, Disenchants, Counterspells, Mishra's Factories, Serendibs, Serra Angels and the usual restricted suspects. All of these are clearly staples for a reason and the deck works like a charm as Michel finds the right order of play. I'm not sure whether Dyan will agree, but I'm naming his deck after the Staples company slogan: "That was Easy". Game 1 and really, I never get a chance. The Lions pounce on me while the control elements take over. I lose and wonder what on earth I am going to do game 2. 0-1. Game 2 and I get off to a decent start. Some fast board development followed up by a Time Walk and Timetwister allow me to finish the game up with a pumped and Berserked Serendib. I feel happy to have at least shown Michel what my deck is capable of: 1-1. Game 3 will decide this and despite winning the last game I feel that this is an uphill struggle. This turns out to be true and in this game I feel like I am always one or two steps behind. Savannah Lions doing damage, as soon as I resolve a Serendib the Lions attack again and being behind in life I have to block into the Bolt, after which the Serra hits even harder. 1-2 and my hopes of becoming the King of the Hill are over. Being knocked out is never great, but Michel was simply the better player on the day. And making top 8 again was definitely more than I had considered possible beforehand. Time to take another beer and enjoy the semi's. The semi's saw a great Atog/Shivan list defeated by Robbie van Bakel, who brought 3 Two-Headed Giants all the way to the final (pic below). Amazing to see the Big Beaters both guys played actually beating Decks. In the other semi, Michel defeated Marten Buhler's midrange explosion to set up a rematch (Michel had won in the Swiss) between himself and Robbie in the final. In a battle between Serendibs, early pressure and Control Magic on Erhnam finally swung it for Michel, who took the final 2-1 to become the inaugural King of the Hill. Beware, mages at N00bcon, because from Holland comes The King of the Hill to challenge you all!